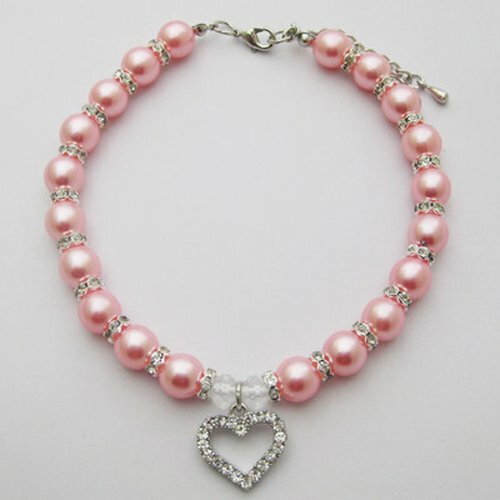 If you are looking for some some unique rhinestone dog collars or crystal cat collars with bling, PetFavorites(TM) pet necklace will be your top choice! With lovely engraved heart charm pendant studded with sparkling crystals and 16 to 20 rings of rhinestones separating 16 to 20 faux pearls, your kitty or puppy look its best for a walk or weekend party. It's so pretty you will want to wear it yourself. So PetFavorites(TM) pet jewelry is undoubted a perfect gift for pets and pet lovers as pet birthday, wedding or holiday costume outfits. Three avaiable colors: Pink, Purple, Blue. Three avaiable sizes: Neck size 8"-10", Neck Size 10"-12", Neck Size 12"-14". Because sizing for each pet is unique and you may pay the return shipping fee if the return is caused by your mistake of choosing the wrong size. Thus please make sure measure your pets' neck size precisely before buy PetFavorites(TM) pet jewelry necklace. PetFavorites(TM) is one popular brand in Asia. We carry pets'favorite supplies & Accessories for mass US pet lovers with factory price. If you're looking for pet toys, you've come to the right place! You'll find a ton of great toy balls, squeakers, ropes, plush and vinyl toys to choose from. Pet clothes, from costumes to shoes, are available along with a great selection of pet apparel and necklaces, like raincoats, life jackets and collar necklaces. To choose PetFavorites, to care for the lifetime of your pets! Made from handmade high quality imitation pearls and rhinestones. With a adjustable jewelry clasp, it was easy to wear and fit. Lovely pet necklace with engraved heart design, perfect for weekend party costume or a perfect gift for wedding & holiday. Three sizes in three colors available. Sizing for each pet is unique. Please make sure measure your pets' neck size precisely before shopping PetFavorites(TM) Dog jewelry necklace.